A new parclo interchange (Exit 9) was constructed with Peter Street west and Olympic Drive east in 2012-14. This replaced an at-grade intersection. 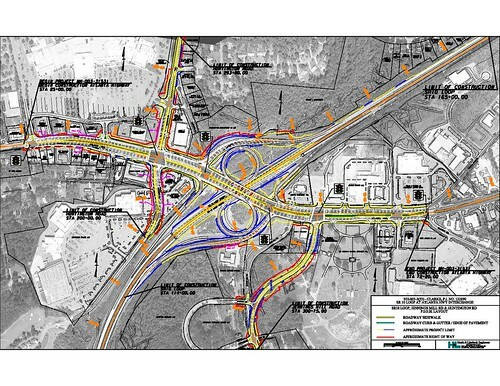 Changes outlined for the parclo interchange (Exit 18) joining SR 10 Loop with U.S. 78 Business & SR 10 near Georgia Square Mall will improve the ramp geometry and add a loop ramp from Atlanta Highway west to the Outer Loop of the Athens Perimeter Highway. This project will begin in 2019. Long since replaced button copy sign posted at the parclo interchange (Exit 18 / old Exit 3) with U.S. 78 Business & Georgia 10 (Atlanta Highway) on the inner loop of the Athens Perimeter Highway. Atlanta Highway constitutes a commercial arterial leading U.S. 78 Business west 2.4 miles to Monroe Highway. Photo taken 01/17/04. Approaching Exit 14 (old Exit 7) with U.S. 129 & SR 15 Alternate (Prince Avenue) on SR 10 Loop eastbound. Prince Avenue angles southeast from the freeway to Downtown Athens, partially along the former route of U.S. 129 and 441. U.S. 129 north travels 15 miles to Jefferson. Photo taken 01/17/04. U.S. 129 south combines with SR 10 Loop east to Exit 12 (old Exit 9), where U.S. 441 & SR 15 south tie into the Athens Perimeter Highway. U.S. 441 joins Athens with Commerce, 16 miles to the north. U.S. 441 south follows the freeway loop south with U.S. 129 to Exit 4 (Macon Highway). Photo taken 01/17/04. Continuing east from North Avenue (Exits 11B/A), SR 10 Loop meets U.S. 29 at a three-quarter cloverleaf interchange (Exits 10C/D / old Exit 11). U.S. 29 south combines with U.S. 129-441 & SR 10 Loop to loop around Athens to the east and south. U.S. 29 north splits with SR 72 east to Elberton in 1.2 miles. Photo taken 01/17/04. U.S. 78 accompanies SR 10 Loop and U.S. 129-441 & SR 8-15 southwest from Lexington Road. The six route overlap crosses the North Oconee River ahead of the diamond interchange (Exit 7) with College Station Road. Photo taken 10/03/10. College Station Road leads west from Exit 7 to East Campus Road and the University of Georgia. The four-lane arterial extends southeast to Barnett Shoals Road at College Station Shopping Center. Photo taken 10/03/10. Trailblazer signage posted ahead of the College Station Road underpass directs motorists headed for SR 316 west, U.S. 129 north and U.S. 441 north to remain along the Athens Perimeter Highway west into Oconee County and north back into Athens. A shorter route to the U.S. Highways north is to turn around at forthcoming Exit 6. Photo taken 10/03/10. Curving west by Oconee Forest Park, the Athens Perimeter Highway advances toward the modified diamond interchange (Exit 6) with SR 15 Alternate (Milledge Avenue) north. Photo taken 10/03/10. SR 15 Alternate follows the pre-freeway alignment of U.S. 129 & 441 north along Milledge and Prince Avenues through Athens to SR 10 Loop at Exit 14. Macon Highway stems west from Milledge Avenue and Exit 6 as the old alignment of U.S. 129 & 441 into Oconee County. Photo taken 10/03/10. U.S. 129 & 441 and SR 15 branch south from SR 10 Loop at the subsequent westbound exit for Macon Highway south and Timothy Road north. Photo taken 10/03/10. Confirming marker for SR 10 Loop inner posted ahead of the Middle Oconee River. The Athens Perimeter Highway is formally named Paul Broun Parkway. Photo taken 10/03/10. U.S. 129 & 441 overlap south from Athens to the Oconee County seat of Watkinsville and the Morgan County seat of Madison. Photo taken 10/03/10. Exit 4B departs for Timothy Road northwest to Epps Bridge Parkway and U.S. 78 Business (Atlanta Highway). Photo taken 10/03/10. Heading south from Exit 4B with Georgia 10 Loop, U.S. 129 & 441 (Macon Highway) travel 2.7 miles to the Madison bypass and 49.3 miles to their split at Eatonton. Photo taken 10/03/10. U.S. 29 south, U.S. 78 west and Georgia 10 Loop inner cross McNutt Creek into Oconee County within the parclo interchange at Timothy Road. Photo taken 10/03/10. Another set of trailblazers direct motorists to remain along Georgia Loop 10 inner back around to the north side for U.S. 129 and U.S. 441 north. Photo taken 10/03/10. Georgia 10 Loop runs along a rural stretch to the north of Barber Creek. Photo taken 10/03/10. U.S. 29 south & 78 west part ways with Georgia 10 Loop and combine with Georgia 316 west from Exit 1 in a mile. Photo taken 10/03/10. U.S. 78 angles southwest from U.S. 29, 3.7 miles west of Exit 1, along a four-lane divided highway to the Walton County seat of Monroe. Photo taken 10/03/10. Travelers destined for Interstate 85 are partitioned to use SR 316 west from Athens to southbound, and U.S. 441 north from Exit 12 for northbound. Photo taken 10/03/10. The Athens Perimeter Highway inner loop reaches the parclo A2 interchange (Exit 1) with Epps Bridge Parkway east and U.S. 29-78 & SR 8-316 west. SR 316 begins here and travels 39 miles as an expressway to Interstate 85 near Duluth. Photo taken 10/03/10. U.S. 29 south & Georgia 316 combine west to Lawrenceville. Epps Bridge Parkway ties into Georgia 10 Loop from a big box retail area to the east. Photo taken 10/03/10. Button copy sign formerly posted along U.S. 29-78 & SR 8-10 Loop east at the parclo interchange (Exit 4 / old Exit 17) with U.S. 129-441 & SR 15 (Macon Highway). Georgia Loop 10 & U.S. 78 eastbound at Exit 17 (U.S. 129-441 & Georgia 15 south). U.S. 129 and 441 lead south from the Athens Perimeter Highway to Watkinsville and Bishop en route to Madison. U.S. 129 & 441 overall overlap 56 miles between Eatonton and Athens. Photo taken 01/17/04. U.S. 129 & 441 north accompany Georgia 10 Loop around the east side of Athens to bypass Downtown. Georgia 15 Alternate follows their previous alignment north along Milledge Avenue from Exit 6 / old Exit 15. Photo taken 01/17/04. U.S. 78 rejoins Georgia 10 east from Georgia 10 Loop at the folded diamond interchange (Exit 8 / old Exit 13) with Oconee Street. Lexington Road leads the two routes east from the freeway to Athens-Ben Epps Airport (AHN) and Oglethorpe County. Photo taken 01/17/04. This diagrammatic sign preceded the half diamond interchange (Exit 10A / old Exit 11A) with Old Hull Road and the western turn of Georgia 10 Loop, where it separates with U.S. 29 north. Photo taken 01/17/04. A loop ramp (Exit 10B / old Exit 11) represents the mainline of U.S. 129-441 & SR 15 north and SR 10 Loop outer. The freeway otherwise defaults onto U.S. 29 north to Danielsville. Photo taken 01/17/04. Leading west from U.S. 29, drivers on the Athens Perimeter Highway quickly enter a parclo B2 interchange (Exit 11 / old Exit10) with Danielsville Road and North Avenue. Danielsville Road is an old alignment of U.S. 29. Photo taken 01/17/04. The on-ramp from Danielsville Road forms an auxiliary lane along the outer loop of SR 10 Loop to split with U.S. 441 & SR 15 north to Commerce. Photo taken 01/17/04. Curving southeast, the outer loop of SR 10 Loop meets U.S. 29 & 78 at Epps Bridge Parkway and Exit 1. The exchange represents the east end of SR 316, an expressway joining Athens with the Atlanta area via I-85. Photo taken 01/17/04.